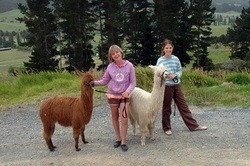 We have alpacas for sale that make excellent pets. All of our alpacas are halter trained before they leave our property so they will be easy to handle and you can take them for a walk. We offer an after sales service so your pets can be sure of perfect care. These unique animals make excellent lawn mowers for a small lifestyle block but do need some care and attention. Alpacas are herd animals and need other alpacas for company so you must always have at least 2 (and preferably 3) for them to be happy. They also form very strong bonds within their herd so it is best to purchase animals that come from the same herd.